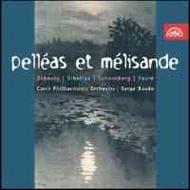 The common thread tying this album together is the 1892 poetic drama Pelléas et Mélisande by the Belgian Symbolist poet Maurice Maeterlinck (1862 – 1949). This tragic drama of love attracted an unusual number of the poet’s contemporaries, (Jean Sibelius, Claude Debussy, Gabriel Fauré, Arnold Schönberg) and inspired them to write a variety of different works ranging from symphonic poems to opera. Serge Baudo created these unforgettable recordings with the Czech Philharmonic in the late 80’s and early 90’s. This double album is being released in commemoration of his 80th birthday, in July 2007 - the Supraphon label’s thanks for his significant artistic contributions to its Gold Fund archive.